As temperatures change across the state, it is important to remember that heavy rains through the winter and early spring caused by intense storms over the Pacific Ocean bring the majority of yearly rainfall to California. Winter rainy season accounts for conditions such as cresting rivers, backed-up storm drains or saturated ground, which all can lead to devastating floods. Remember that the best way to get financially protected against flood damage and help ensure a speedy recovery is to have a flood insurance policy. Despite’s California’s increased flood risk, less than 2 percent of the state’s households have flood insurance. Most homeowners insurance policies do not cover flood damage – only flood insurance policies provide financial protection from flooding. 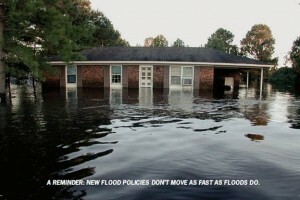 Also, flood insurance policies typically take 30 days to become effective, so the time to get protected is now. California has thousands of miles of levees designed to protect the lives and property behind them from floods. However, no levee provides full protection as they are only designed to a “specific level of protection.” If a levee fails or is overtopped, the flood damage may be more significant than if the levee were not there. If your community contains a levee, have your customers reach out to local officials to find out about the levee and the related flood risks based on where their property is located. The wildfires common to California also increase the risk for flooding during the winter months. More than 100,000 acres were severely damaged from wildfires in California this year alone, which makes the land more vulnerable to floods and mudflows given denuded ground due to lost vegetation. A_Recipe_for_Flooding an illustration of the flood risk.